Yay, it's the last month of the year!! Thanksgiving, Christmas and New Year are always my favorite part of the year apart from my Birthday in March. While I've been going through old posts I'm seeing old giveaways, places I've reviewed that are now closed and I'm wondering how to treat these posts. Do I get rid of the giveaway? Still doing research on cleaning up the blog and it's quite interesting. I went to Charleston for four days with a friend of mine. We went the weekend right before Thanksgiving and it really was the perfect time to go because we got to see Christmas decor and even do a Christmas light tour but there weren't the Holiday crowds, win! I'll be writing one more post about all the touristy things, but you can read about all the food I ate on our road trip here. Thanks to my dad, we were able to get discounted Mickey's Very Merry Christmas Party tickets but that means you go when it's less likely to be busy aka nowhere near the actual Holiday. It was still quite busy and we won't be going back but we enjoyed our time there, together. I read some good books and finally got around to reading November 9 this month! I'm pretty sure I had started this book, but I didn't remember most of what happened, only some parts of the beginning. It was good! Strawberry Festival tickets go on sale today and I'm hoping to score some Reba tickets!! *crosses fingers* I'm also looking at new places in Tampa and Pinellas county I want to try. After visiting Charleston I'm like "we have a lot of great places to eat, too" so I need to be trying all of those with friends! Plus I'm planning on when I'll visit Disney while my pass is still good! Since I visited a lot of new restaurants on my road trip, I thought I'd mention that this one is local to Clearwater and was sooo delicious! Since it's Mexican, we have to talk about their chips and salsa game being top notch. 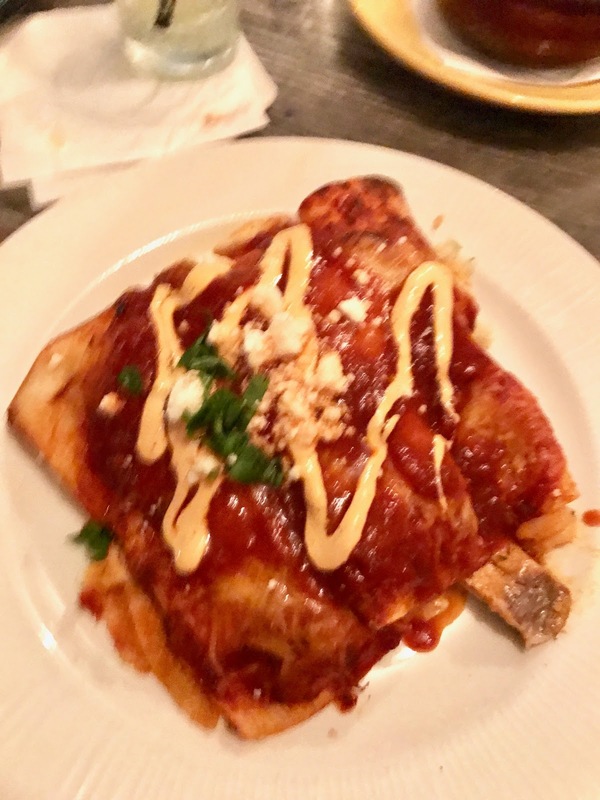 I also tried one of their specialty margaritas and it wasn't bad but the main dish, a seafood enchilada was amazing and huge! Very much worth the money. 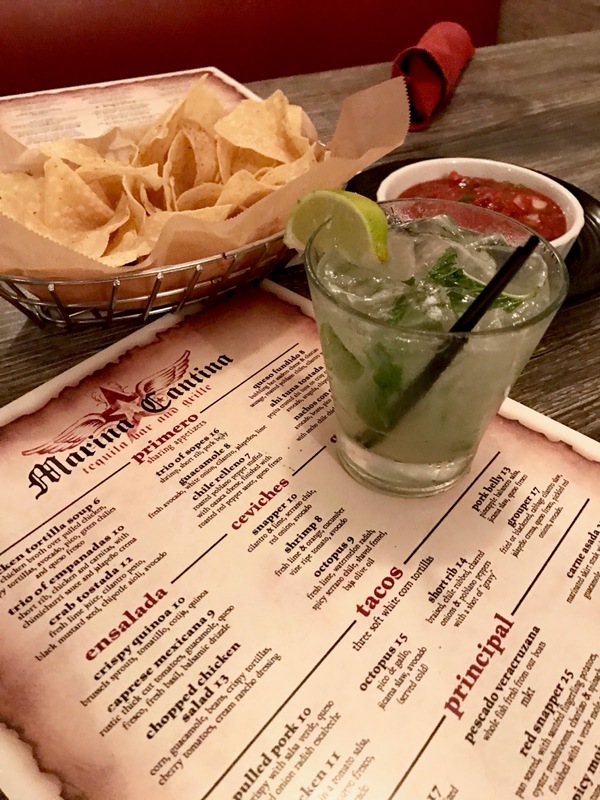 If you're in Clearwater and don't want to do Frenchy's or palm Pavilion I suggest trying Marina Cantina. If you make a reservation you can sit on the patio but the inside is quite nice as well. I know this first pic is blurry but I didn't realize it until it was too late. 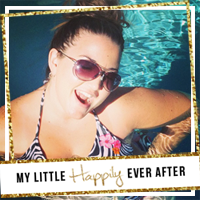 November always brings out the thankful vibes and I shared what I'm thankful for in one big ol post last week. Thanksgiving this year was easy, UCF won and I got to see a couple friends that were in town to visit family. This included the beach, Frenchy's sunset and trying out another new restaurant that didn't stack up, but the reviews for The Little Lamb were very good so A and I decided it needed to be tried for dinner for a full review. I bought A LOT of stuff during all the sales. Some for me like makeup, a blanket/comforter and socks. More for others, we adopt a family every year and I love getting them the stuff on their list knowing it's exactly what they asked for. Giving gifts is definitely one of my love languages. I put up my pink Christmas tree at work this year. I don't think I did it for a year or two because when I had one at home I also put up and decorated, plus had to take down it just wasn't as much fun to do it at work, but since I'm living with my family again I didn't have my own tree to put up. I love food! I’m sure I’m not alone in that, but when I travel I have to be careful that the whole trip doesn’t become about eating all the things. 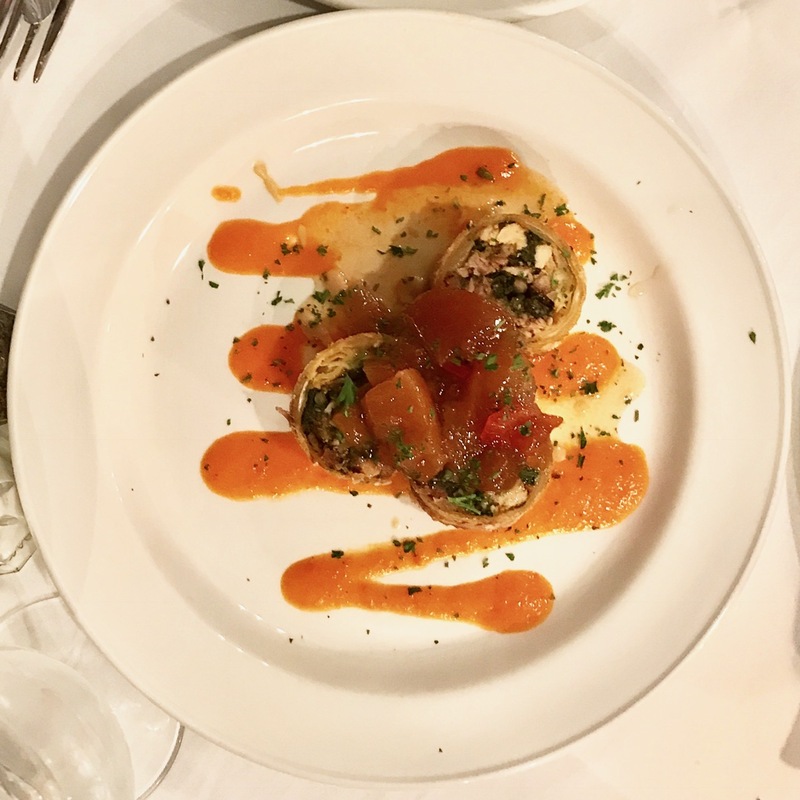 On my latest trip, I traveled with a friend to Charleston, South Carolina and definitely had some mind-blowing dishes and drinks. 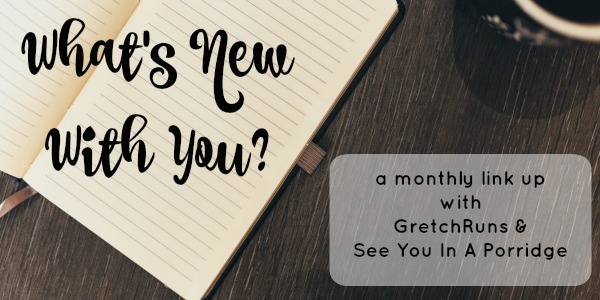 We started out early Saturday morning and while I planned on stopping for McD’s or Starbucks on our road trip, we had a bit of a detour because I was so excited that I missed our first turn. Doh! After that fiasco it was such smooth sailing that we both commented on it as we arrived at almost exactly the time I estimated AND we stopped in Pooler, GA at Cheddar’s Scratch Kitchen to enjoy a sit down lunch. Their Buffalo chicken sandwich with baked potato side sounded good and not too heavy. 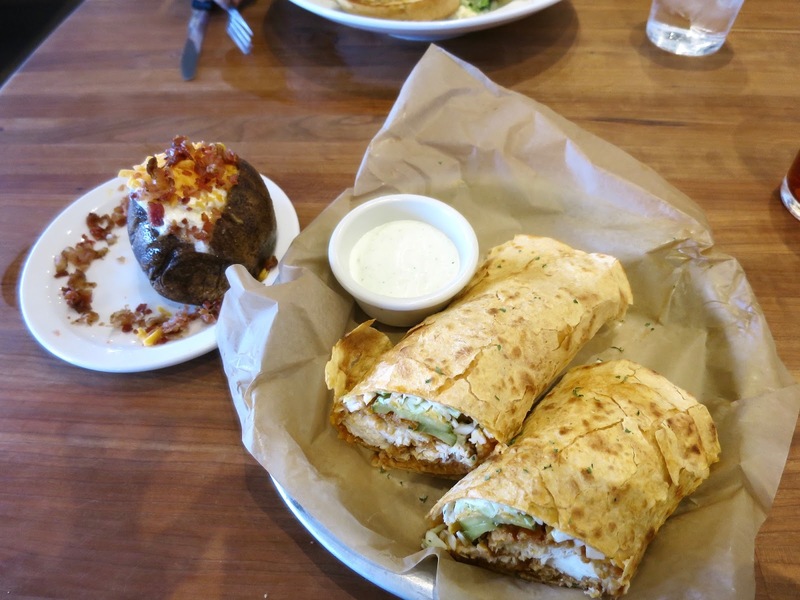 It’s definitely something I would order again, but their menu was expansive so I’m sure I’ll head to our local Cheddar’s to try something out sometime. I was driving, so I didn’t try a drink which will happen a few more times on the trip, but I also got to a point where I’d had plenty of alcohol, plus it can get expensive if you indulge at every meal. Am I right?! Since we arrived in the late afternoon on Saturday and had a carriage ride scheduled I had penciled in a cheap sandwich spot I had found but we ended up trying something with a little more night life and it was a great choice. 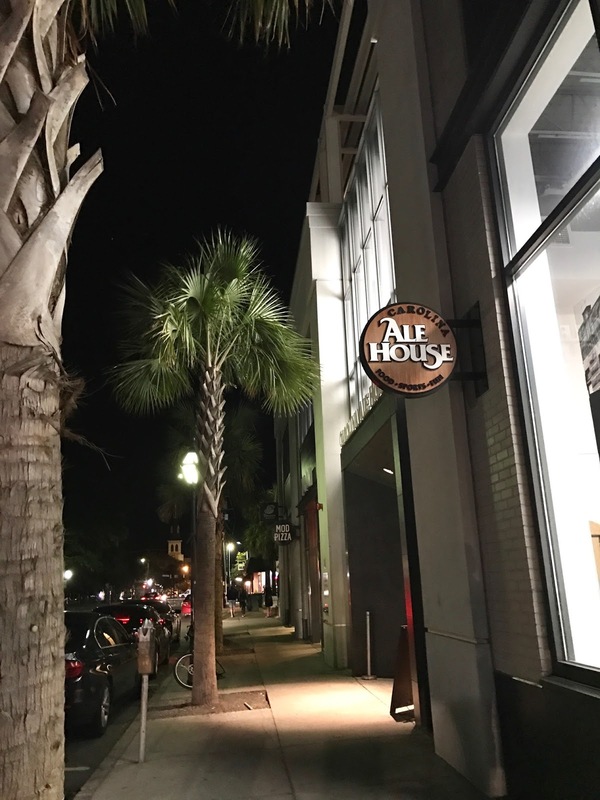 While we have Ale House in St Pete and I’ve been to the one in Orlando, Carolina Ale House had quite a selection of local fare, food and drink offerings. It’s also close to being a rooftop dining spot and we were seated just inside from the patio so we had some pretty great views. I always like to see what restaurants have for special drinks and dishes and as soon as I saw that the Nacho Burger included chips and salsa I was sold! 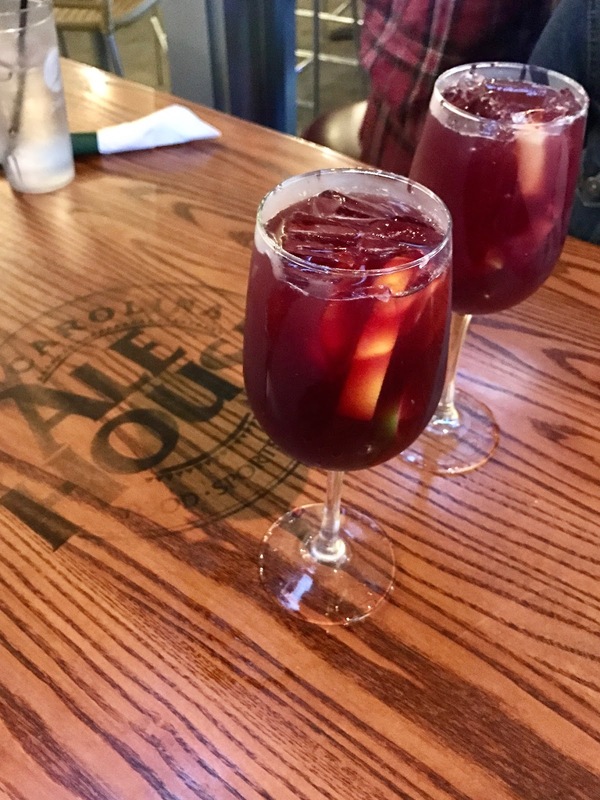 I also tried some sort of South Carolina Sangria that I don’t know the name of and now I’m kicking myself because their mixed drinks aren’t listed online. It was a typical sangria so it doesn’t really matter, but I know I thought the name was cute! Also, I only managed to get a picture of the drink and not the burger. To be fair, when they brought out my dish it had fries instead of the chips and salsa so I was a bit flustered waiting on my coveted chips and salsa!! Sunday morning is all about the brunch and even though our hotel had complimentary breakfast I wanted to try out a breakfast place while we were there so we hit up Kitchen 208. I loved that we didn’t need a reservation and even when we walked past this restaurant a couple times throughout the weekend there was always a table so they have plenty of seating despite their good reviews. 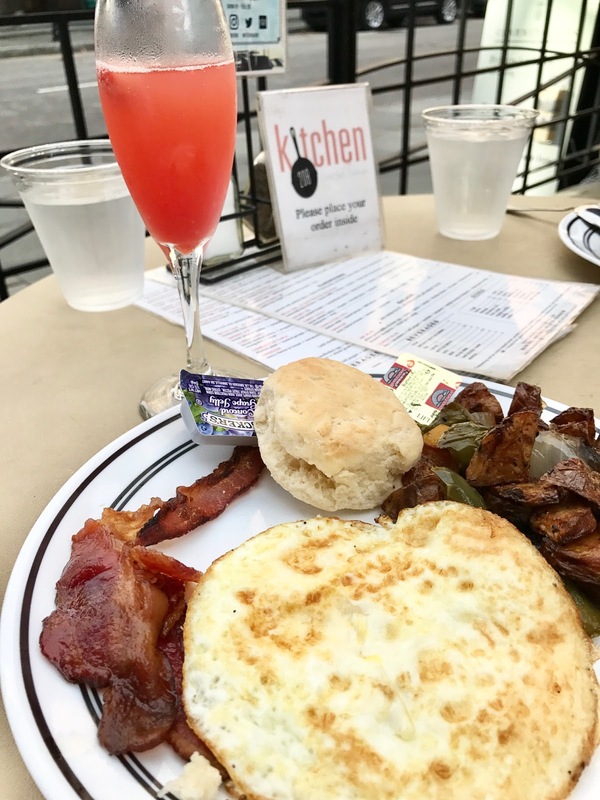 I had the Charleston breakfast platter, and a strawberry mimosa. One of the reasons I decided to go with this restaurant is their mimosas were so affordable. I’ve been places where they were charging $9 for a mimosa which to me is just highway robbery, but I’ll happily buy one or two $4 glasses anytime. One of the places that was recommended on several blogs and also by a coworker was Magnolia’s. Now, the dinner prices were not what I was looking to pay so I scheduled us to eat there for Sunday lunch/brunch and it worked out perfectly. Even though we ate only a few hours earlier, after we did the Sunday morning market downtown we hopped over to Magnolia’s on the way to our next stop and were able to get a table right away. Brunch here was the perfect way to try one of the best places we ate in Charleston while keeping to my budget. We shared the Down South Egg Rolls which were one of the highlights of my foodie weekend, so good! 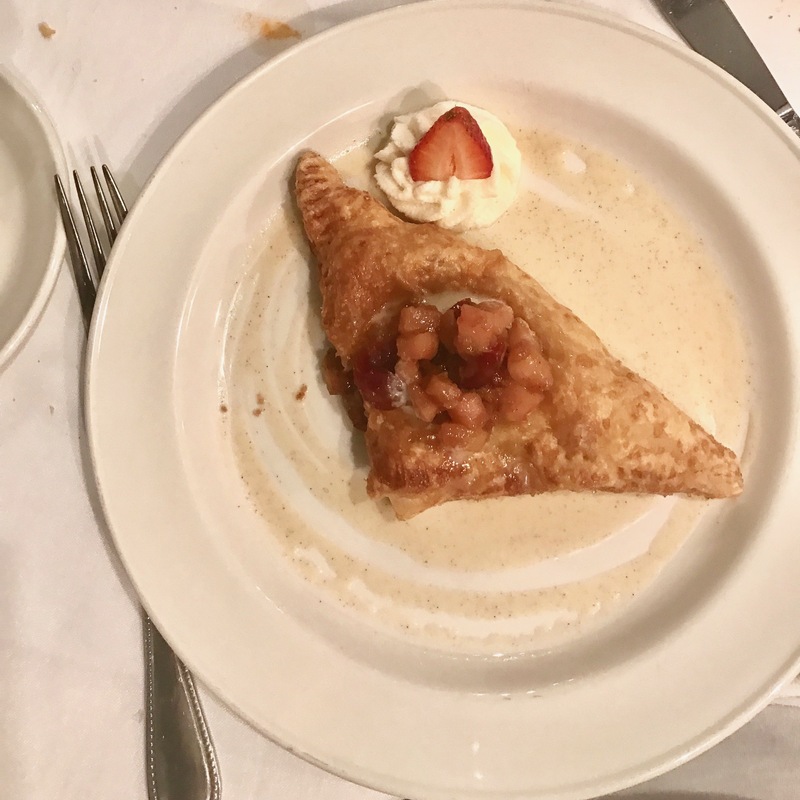 I went with a cup of the blue crab bisque and finished off my meal with a cranberry and pear turnover from their specials menu. I loved that while it was dessert to me, it wasn’t technically on the dessert menu, lol. For my drink, I tried their white sangria and it was on par with most sangrias, but nothing compared to the food. My friend Jessica on the other hand tried more of a specialty drink and she loved it. 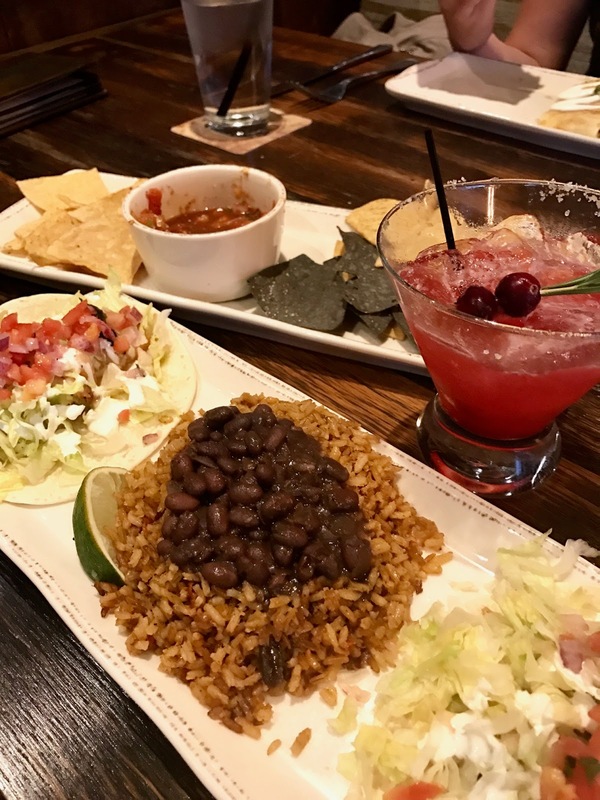 Sunday night, we tried a restaurant that we stumbled upon very close to our hotel and the visitor center, SOL Southwest Kitchen. I’m always up for Mexican food and Jessica knows this about me so after we confirmed that their reviews were at least four stars we added it to the list. It did not disappoint! In fact, my favorite drink of the trip was here. I’m a margarita drinker and love when they have specialty margaritas, especially Holiday themed. After getting a glimpse of the picture worthy margarita, I had my first sip and my taste buds had a joyful celebration. I immediately snapped a picture of the ingredients because I was going to need to recreate this with my bartender sister again before the Holiday season was over. While I enjoyed the salsa, and my tacos were great the star of Sunday dinner was definitely the Cranberry Spiced Margarita. If you’re in the Charleston area this Holiday season make sure to stop in for this drink ASAP! I think we finally tried the cupcake shop around the corner from our hotel on Sunday night. 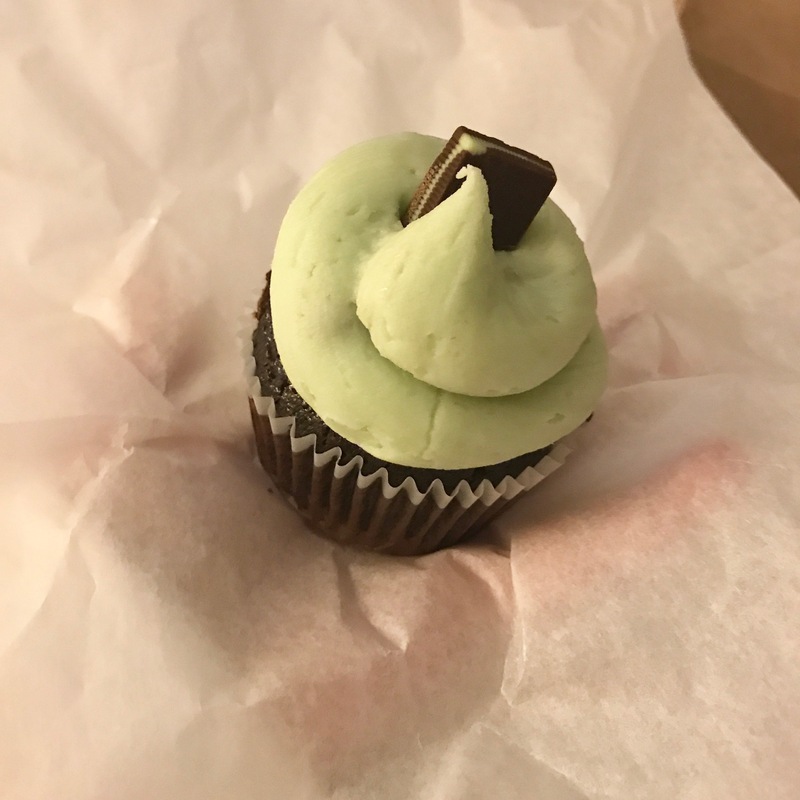 We ate such great food that we weren't ever walking around hungry, so on our way back to the hotel we stopped and picked out a cupcake to try from Cupcakes Down South. Of course, I had the mint chocolate and while it was delicious, it was so sweet and I couldn't finish it. The girls that run this shop were so nice, and if you're looking for a cupcake place downtown Charleston, definitely check out Cupcakes Down South. 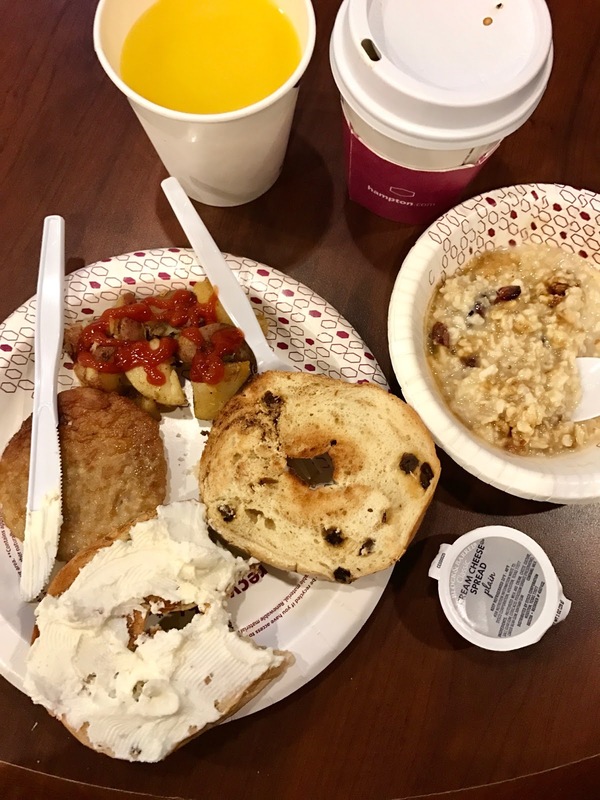 Monday and Tuesday morning we enjoyed the complimentary breakfast at The Hampton Inn we stayed at. They had a wide variety of food and while it wasn’t anything to rave about it was free. Their coffee on the other hand was definitely something to mention. I didn’t feel a need to stop at Starbucks once on this trip and I’d say that’s quite a feat. Monday lunch was probably the most disappointing of our trip. Since I was trying not to be too much of a time organizer, we changed up some things and ended up in Mount Pleasant for lunch on our way to Boone Plantation. We quickly used the good ol’ internet search for “Mount Pleasant restaurants” and there were multiple 4+ star restaurants so we chose the first one, Graze. It reminded me of a place I would go to at lunch with coworkers or my dad that catered to multiple generations of clientele. Our service was almost non-existent and neither of us finished our food. 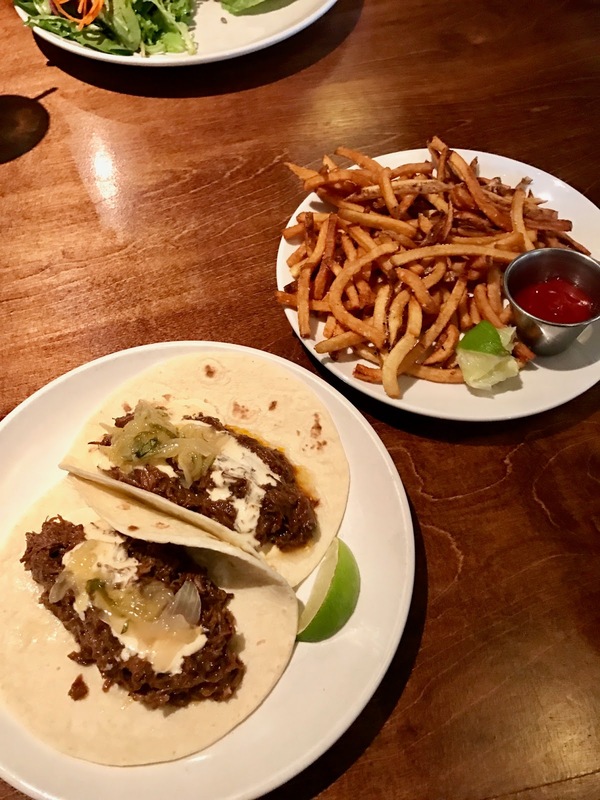 I tried the Citrus Chili Short Rib tacos and while there was a lot of meat on the tacos, the crema and mango relish which highlighted this dish for me were minimal and drowned out by the barbecue flavor of the meat. Since we live near beach vacation spots I knew I wanted to check out what Charleston had to offer. While it was much smaller than Clearwater or St. Pete beach, I loved how quaint Folly Beach was. 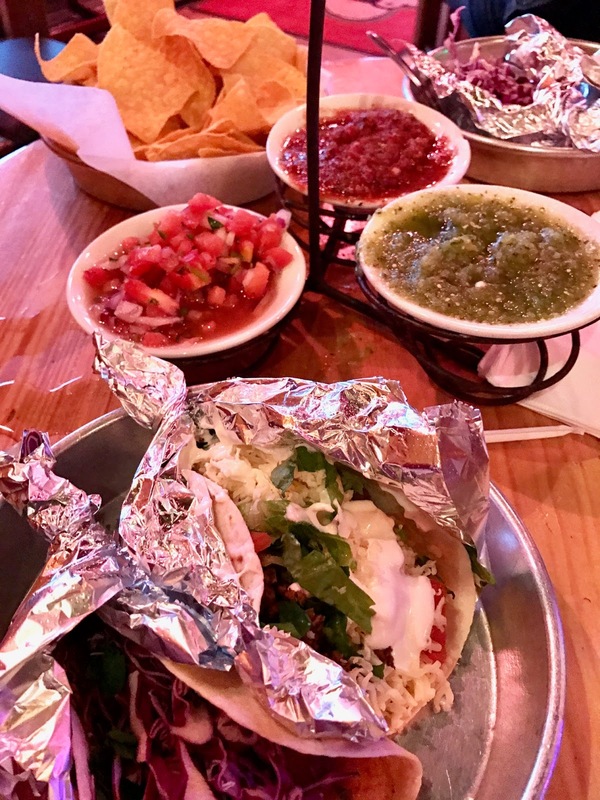 Our final food stop in Charleston was recommended on several blogs, including Biana at B Loved Boston and that was Taco Boy. Since they had a Folly beach location that was our destination and the hype was well deserved. I loved their ambiance, the salsa trio gave us several options to taste and of course their ala carte taco selection was on par. I tried the Taco Americano which is a more traditional ground beef taco and the Sautéed Shrimp since we were at the beach, hello seafood! They were both delicious! I couldn't talk about food and not mention the dessert and hot cocoa we had at the one Christmas thing we went to, Holiday Festival of Lights. 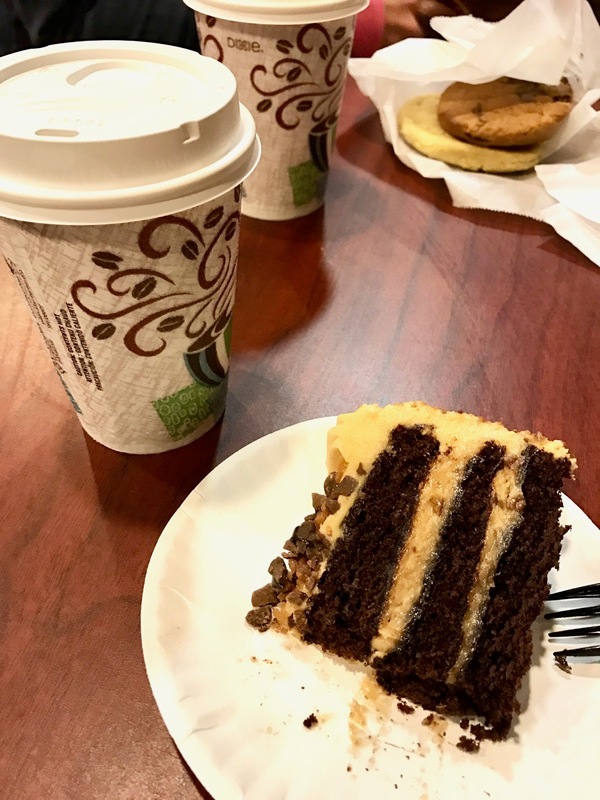 After you drive through dozens of light displays at a local county park you can stop in and do a number of things including visiting their snack shop where I tried a delicious peanut butter chocolate cake and of course we got some hot cocoa to warm us up! While we could have stayed and hung out in Charleston for one last morning we decided to hit the road and meet up with a friend of mine for lunch in Jacksonville on our way back. 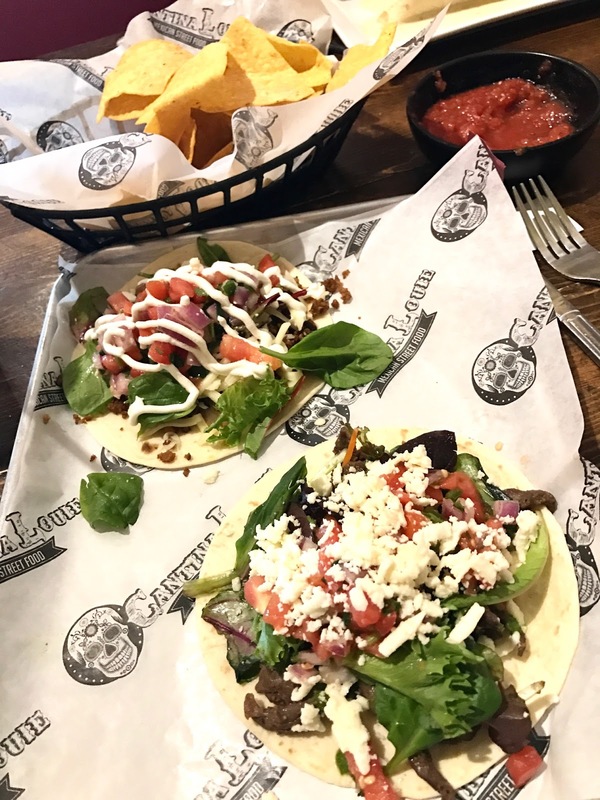 While I was researching Charleston restaurant suggestions, I came across a Charleston blogger that mentioned a Mexican restaurant on her last road trip. I was disappointed to find out it wasn’t in Charleston, but I immediately penciled it in as somewhere we could stop on our road trip since it was in Jacksonville aka on the way. Cantina Louie is definitely a place I’ll be going again when I’m in Jacksonville. I had the Chimi Chimi Bang Bang taco, delicious and tried their Taco Tijuana with Chorizo which was amazing! 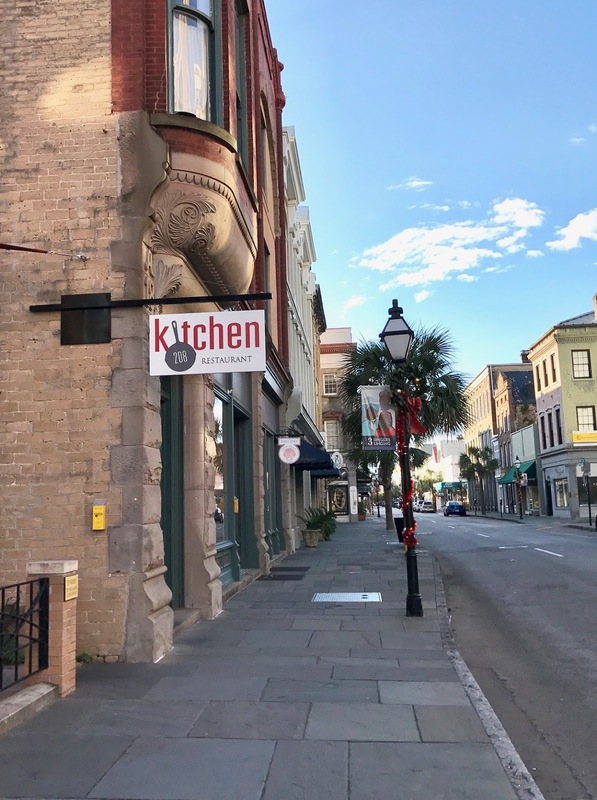 All in all, our food adventures in Charleston and during our road trip were some of the best food I’ve had on vacation. 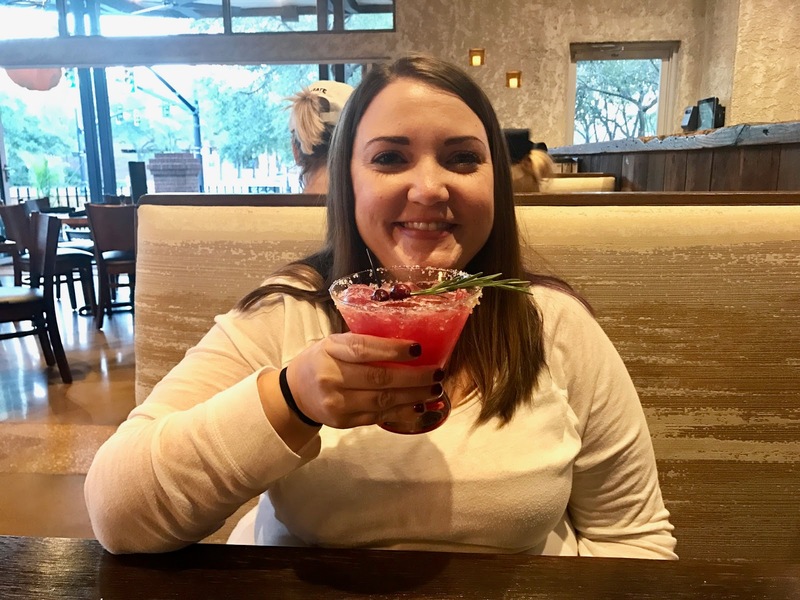 When people have asked me how the trip was, I mention the regular touristy things like rainbow row but I also make sure to tell them about Magnolia’s, and the amazing drink at SOL Southwest Kitchen. Thanks for being scrumptious Charleston! Do you like to try a lot of local cuisine when you travel? Good morning! This week after vacation has been rough on the sleeping side, but work hasn't been too bad so I can't complain AT ALL. 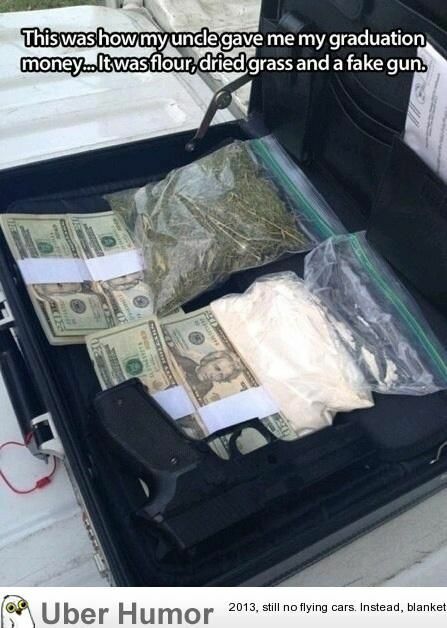 I'm looking forward to a sort of low key weekend with a few plans. 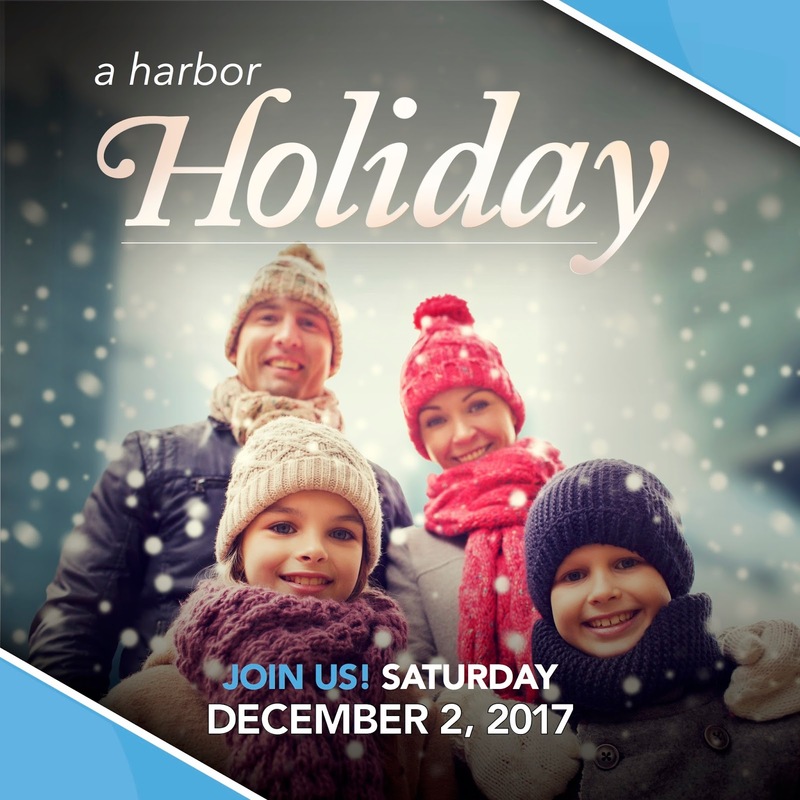 One of our local small towns is having a Holiday trolley event and our church is hosting one of the spots at waterfront park with ice slides...in Florida. This will surely be interesting. I ran to the mall last night and picked up a few things with gift cards, coupons and sales so I got away with quite a bit for so little. i love this time of year when most people are in a giving spirit. Are you done with your Holiday shopping? 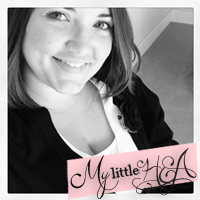 It's time we get right to the Favorites for this week, but if you missed it, make sure to check out my Thankful blog post from yesterday. 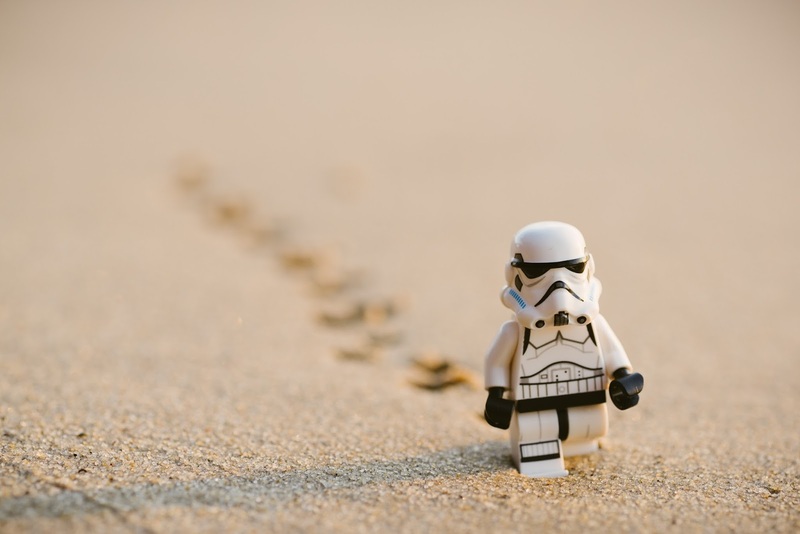 So many, but definitely that it's Friday, the first of December, Christmas is 25 days away and Star Wars: The Las Jedi is TWO weeks away!!! 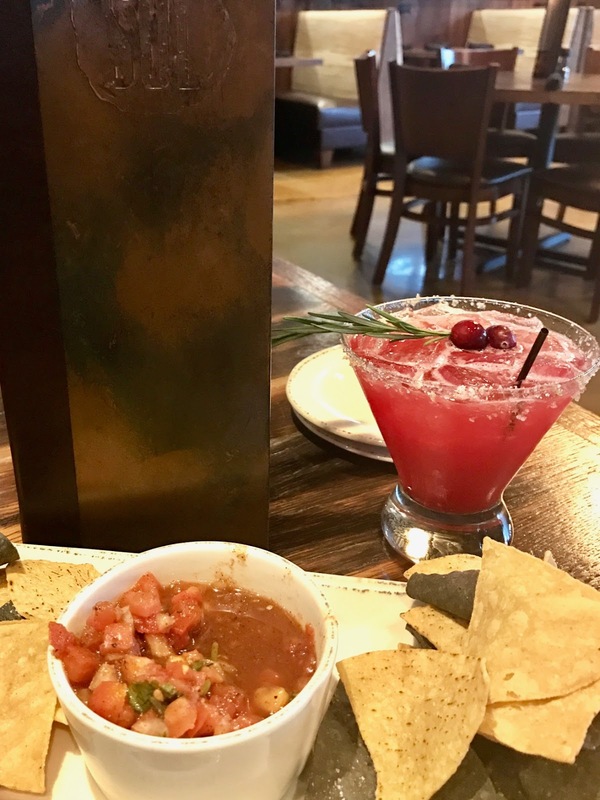 This Cranberry drink at SOL Southwest Kitchen - Cranberry Spiced Margarita. Don't get me wrong we ate at a lot of good places BUT OMG this drink was perfect and totally got me in the Holiday spirit! A couple bloggers have listed The Seven Husbands of Evelyn Hugo on their book rec posts so I added it to my library list, I love old Hollywood stories and movies. It was totally not what I was expecting and I couldn't put it down. P.S. Her album drops today.